This is a variation, on an older post of mine. See the original one here. When it comes to minimizing toys, I try and purge our toys both before and after each special occasion. So once before and once after my daughter’s birthday, once before and once after my son’s birthday, once before and once after Christmas, and once before and once after Oma visits (my husband’s mom lives in Belgium and quite literally is the most generous person I know). Why before and after? Well before is preemptive and in anticipation for what is to come. After is because once we have received gifts, older toys may seem redundant and of less value. When doing this, despite making things more difficult, I try and involve my kids in the purge. While I don’t do this each and every time, it’s amazing the negotiation tactics a three-year-old can employ when a useless McDonald’s toy gathering dust is about to hit the road for good. 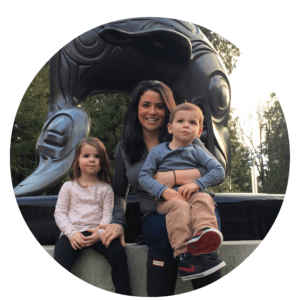 However, I want to explain to my kids that some other children are less fortunate than they are and I want them to understand the sacrifice of giving something up for someone who doesn’t have as much as them. I also want to underscore appreciate for the toys they do have. When minimizing toys, here are some strategies I employ to decided what should stay and what should go. Toys that encourage open-ended, imaginative play. Examples include blocks, figures, items that are toy versions of real-life items, play dough, dress-up clothes, and arts and crafts supplies. Play is pertinent for exploration, problem-solving, and trying out more complex skills and these toys encourage this. Toys that grow with your child. Examples include what is mentioned above, dollhouses, train sets, and lego are all items that can accommodate the most primitive to the most elaborative of play. Classic toys. Dolls, farms, blocks, cars, trains, planes, phones, and other similar items have been played with for generations. When it comes to the longevity and the relevance of toys timeless seems to be one of the best rules of thumb. Anything really specific to an age group is not worth keeping for long. The exer-saucer, play mat, and textured baby dolls are amazing educational toys from the under one crowd. Shortly thereafter, they need to go. The same goes for Duplo after your kids have graduated completely to lego and so forth. Toys that have little or no play value without the use of battery operated buttons. You may think but my Vtech or Leap Pad [insert name here] is so educational. Sure it sings, moos, and rhymes more than any other toy listed in the examples above. However, it requires next-to-nothing from your child. Sure your child may join in their approximation of song, or press a combination of lights, but research shows these are the worst toys. Yes, I said worst. While a song that plays inside a toy castle, or a train noise on a train set are hardly a big deal, the ones that are reliant on batteries for the majority of their value are worth donating. Based on the best information at hand, these toys are used literally and literally. So while I stick from a tree outside may be used to conduct an orchestra, knight a soldier, or bibity bobity boo rags into a ball gown, a buttoned, battery operated toy tends to be used only the way the toy maker intended it to be used. Broken toys you’ve been meaning to fix for ages but haven’t. Self-contained toys are a momma’s best friend. Playmobil, Mr. Potato Head, Lego, and Mega Bloks all have self-contained options. When choosing gifts for friends’ kids, I love choosing something that can be put away inside itself. Containers with lids are another favourite. I try and keep things organized in their respective containers away from our main play area. The kids can go and grab a container or two to play with. Once those toys get cast aside or we are moving on to something else, we return them to their containers. (NB I’m not perfect at this. It is a continual work in progress). Rotate toys. Using the shelves of closets, the basement, crawl space, attic, or storage area in your apartment building, rotate out your children’s toys. This keeps things exciting, minimizes the mess you’re left with, and also can prove which toys aren’t worth keeping if you and the kids end up forgetting about them altogether. 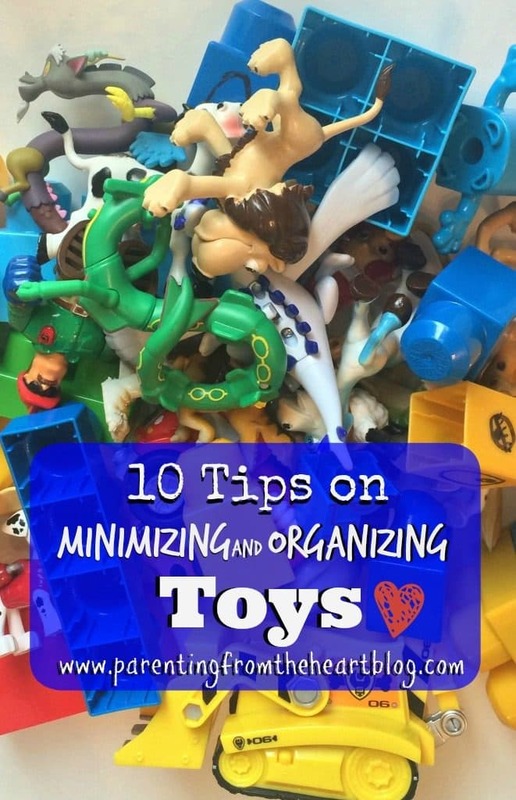 When it comes to toys what are some of your own strategies to minimize and stay organized? Like this post? Do me a favour and click the banner below to cast a vote for my blog. I didn’t purge before this Christmas and I’m so, so so regretting it right now. We have a playroom that normally contains the toys but they’re all over the fricken house right now and it’s half driving me insane. The other half of me doesn’t give a crap and I just want to eat more cookies. Yessss! Zoe and I went through and gave away a ton of toys before Christmas. But now that it’s over, we’ll need to go through everything again. Theres just soooo much stuff!!! Great tips on keeping it organized. Every time I try to have a yard sale, the kids are suddenly interested o that toy they haven’t touched in months. My husband has been trying to get rid of the sit n spin for months and despite it, we still have it. Great advice! I forgot to organize before Christmas, but I really need to do a big purge now. They are fairly organizes because I love storage crates and bins, but we have way too much stuff! I need to rotate toys more.. that is such a good idea! GREAT tips! We didn’t purge before Christmas, although, we said we were going to, we just never got it to! But we did do a bunch of purging, reorganizing and rearranging the day after! Everything feels so much more put together! We still have a few things we need to switch out, but all in all I’m feeling a bit better on the toy situation in my house haha! I bought containers and lids! It’s been on my list for so long. I have been putting off purging toys because Cohen “might” use them, but they are building up and it’s getting out of control. Here’s to organization! Ever since moving, we have TOYS EVERYWHERE! This is definitely a helpful post for me! Self-contained toys are truly a blessing! Creating a routine with the kids reinforce the idea of keeping toys, books and craft items where they belong. At the end of the day parents and children have to work together to make it happens until its comes naturally. I have some kids organizing rooms tips Thanks for these great tips !! Having a clean-up routine makes so much sense! Thanks so much for sharing your insights! Thanks so much for reading and for your comment. 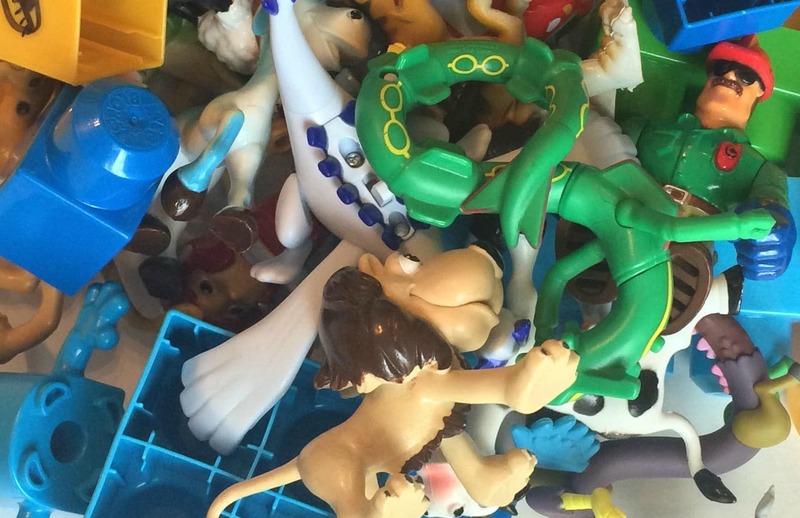 Deciding which toys can stay and go is definitely part of the battle when minimizing toys! I am with you! We have so many toys and so much clutter it makes me crazy! We’re giving away and donating all the time-and there’s still always more. We’re in the process of moving so we’re really getting rid of stuff now, with the exception of the favorites of course! Thanks for the tips! I now have fantastic reasons to get rid of the obnoxious sound making toys.